“African diaspora music never felt so far ahead and yet so close. Modern, self-sufficient with a middle finger attitude!” – M.I.A. 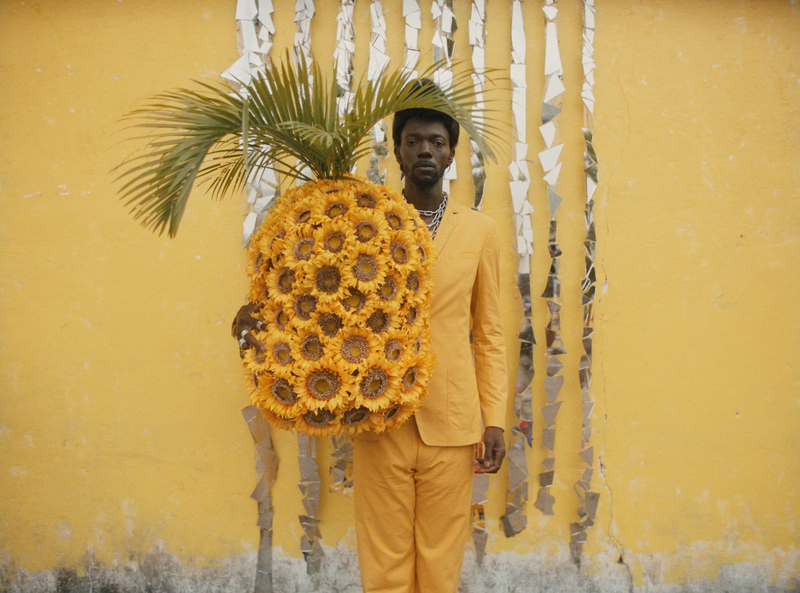 Congolese-born, Belgium-based artist Baloji today released a new afro-electro single, “Spotlight & Miroir” (ft. Marshall Dixon & Poison Mobutu) from his upcoming album Kaniama: The Yellow Version, out May 3 via Bella Union. CLASH premiered the remixed track about our digital obsession and phone screen spotlights, which mirrors themes in Baloji’s previous short film “Zombies” that premiered via NOWNESS. The original “Spotlight” comes from Baloji’s previous album 137 Avenue Kaniama, which was released last year on Bella Union (Fleet Foxes, Beach House, Father John Misty). The label is re-releasing the album as the artist originally intended it, as a one-track mixtape on May 3. In a world of fleeting singles, Kaniama: The Yellow Version brings back the full album listening experience. Baloji is an artist in motion, a musician, poet, film director and man of many images and ideas. Baloji means “man of science” in Swahili, but shifted during the colonial period to “man of the occult sciences and sorcery.” With influences from Outkast and LCD Soundsystem to African rumba king Tabu Ley Rochereau and salsa music legends Fania Records, he mixes hip hop culture with Congolese guitars and a melodic approach with some French chanson structure. His perpetual motion is showcased in music videos like “Soleil De Volt,” where he fronts a satirical variety show band with flamboyant flare, also apparent in his sharp curation of Komono eyewear collections. Baloji will soon embark on an international tour, as well – dates here. 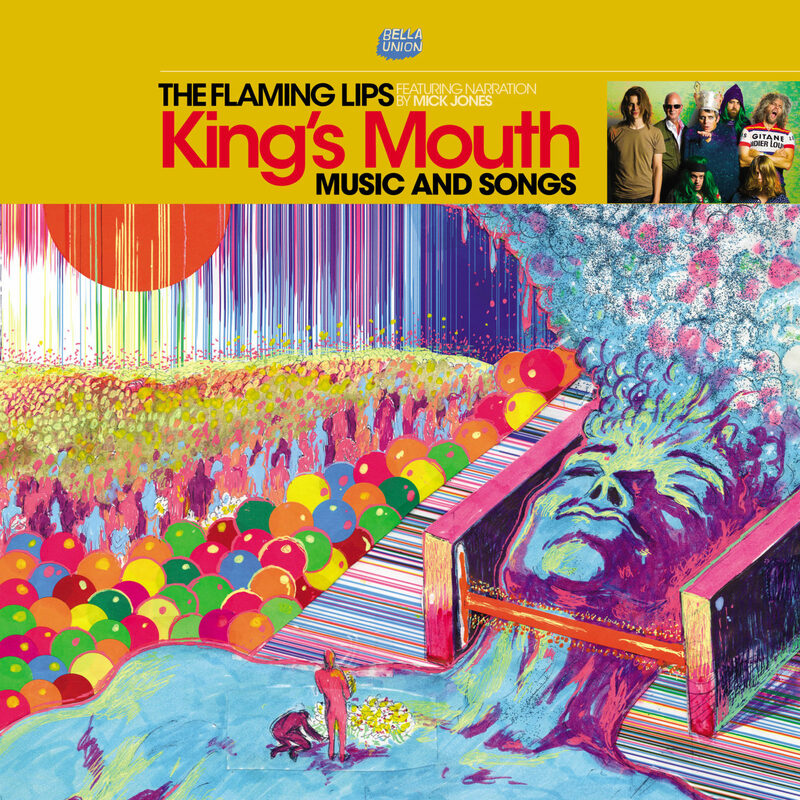 Following its limited–edition vinyl–only release for Record Store Day, The Flaming Lips have today announced the worldwide release of King’s Mouth, their fifteenth studio album, on 19th July via Bella Union in the UK/Europe and Warner Bros in the US. The band have shared a first track entitled “All For The Life Of The City”. King’s Mouth sees the iconoclastic outfit once again tread uncharted territory. These 12 new originals are threaded together by cinematic narration courtesy of The Clash’s Mick Jones. Additionally, the music parallels front man Wayne Coyne’s immersive art installation of the same name. Introduced in 2015, the installation has showcased its psychedelic visuals and soundscapes through North America in museums such as Meow Wolf in Santa Fe, NM, the American Visionary Art Museum in Baltimore, MD, the Pacific Northwest College of Art Portland, OR and Wayne’s own creative space, The Womb, in Oklahoma City, OK. A true handcrafted marvel, it consists of a giant metallic head that welcomes spectators inside. Once inside of the foam month, an LED lightshow begins in tandem with music from the album. Now, the record doubles as the sonic companion to the exhibit and allows fans to experience the aural side at any time. Further expanding this multi-faceted world and detailing a fascinating creation myth, the accompanying literary tome, King’s Mouth: Immerse Heap Trip Fantasy Experience tells the story of the King’s Mouth through words and visuals by Coyne,adds yet another dimension to the project, which ranks among the band’s most ambitious thus far. The Lips recently teamed up with The Colorado Symphony Orchestra for an encore performance of their seminal and celebrated 1999 offering, The Soft Bulletin, from top-to-bottom at Denver’s Boettcher Concert Hall. This follows up their original 2016 performance of The Soft Bulletin together at Red Rocks Amphitheatre—noted by critics as one of the most important events ever held at Red Rocks in their 75-year history. So… The Soft Cavalry. What is it? A happy accident? A lovers’ story? A crisis of faith? In reality, it’s all of these. 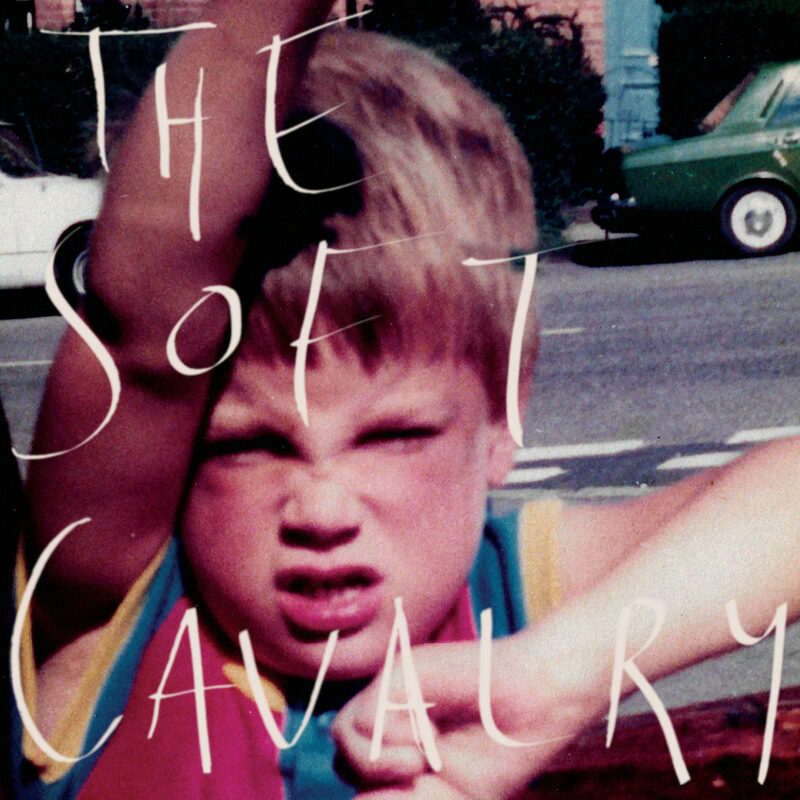 For Steve Clarke, The Soft Cavalry’s self-titled debut album is equally a labour of love, and the first record he’s masterminded from start to finish, with invaluable contributions from his wife, Slowdive’s Rachel Goswell, on co-vocals and spiritual/practical guidance, and Steve’s brother Michael, who produced the record. The band’s music is a particularly British brand of intense cinematic drama. Melodic and timeless, the album lands in the atmospheric dimensions between Pink Floyd, Talk Talk and R.E.M. A record radiating midlife crisis but equally enormous elation; a helix of fear and hope, aching for resolution. A record Steve emphasises that he “needed” to make. The album is also a way of rewriting a man’s narrative, and proof that relative late bloomers (Steve was in his late 30s when he made the album) can make the record of their dreams. In 2014, Steve was stuck. Divorced since 2011, the intervening three years had been, “a haze,” he admits. Since the late nineties he’d played bass and sung backing vocals in bands (both studio and live) and sessions, while also working as a tour-manager. His new assignees were reformed Home Counties faves Slowdive. The Soft Cavalry is equally an exercise in creative and personal therapy. The first songs Steve wrote for the album were less about confusion than Rachel-inspired paeans to fate, love, new beginnings: ‘Passerby’ (“Waters break and we are born restlessly into the arms of this unknown”), with Rachel’s gorgeous lead vocal underlining the arrangement’s Slowdive-adjacent ethereality, and ‘Spiders’ (“strand of woven thread / Could be the start of something beautiful?”), a starker, shivery ballad with a feeling of suspended animation. But as Steve opened up, the past began to seep in; years of frustration, anxiety and confusion. As the album progressed, Rachel formed Minor Victories in 2016 while Slowdive had a gap in the schedule, alongside similarly holidaying members of Mogwai and Editors, for a self-titled album that she and Steve contributed vocal melodies and lyrics to: “it got the cogs turning on a writing and lyrical level, and gave me a certain amount of self-belief,” he says. So, this happy accident, lovers’ story, crisis of faith, labour of love and therapy session is set to continue – Steve’s already got the next installment written, titled The Lost Decade. Lost versus found. Recovery versus self-doubt. The Soft Cavalry has arrived. ‘Chaturanga Rebuilt’ is a new version of the first song I ever wrote. In the years after writing it I initially pushed it aside as I grew into my craft a little more; I had never really been satisfied with the original and felt it didn’t represent what my music had gone on to become. But last year I finally made the decision to revisit it, re-learn it and in the summer of 2018 my band and I played it live for the first time in years. Suddenly I finally ‘got’ it and decided I had to re-record it the way it should have sounded in the first place, now that I have the voice, ability and ear to be able to do it the justice it didn’t get back in 2012/13. Having recently announced news of their upcoming album ONDA and fresh off the back of their weekend performance at Coachella music festival, Jambinai have debuted two new singles titled ‘작은 위로가 있는 곳에(Small Consolation)’ + the album’s title track ‘온다(ONDA)’. The South Korean band have also shared a breathtaking performance video of ‘작은 위로가 있는 곳에(Small Consolation)’ which gives fans a taste of what is to be expected from their 2019 tour. Even fewer would have predicted that the likes of Jambinai would play the 2018 Winter Olympic Games closing ceremony in the city of Pyeongchang, accompanied by a troupe of geomungo (Korean zither) players – an audio-visual spectacle that such an occasion demanded. Click HERE to watch. The first big wave arrived in 2010 after traditional music students Lee (guitar and piri, a bamboo oboe), Kim Bo-mi (the bow-stringed haegum) and Sim Eun-young (geomungo) joined forces and released the Jambinai EP. The trio’s debut album Différance won Best Crossover Album at the 2013 Korean Music Awards, triggering several overseas tours and the second wave of Jambinai – an international deal with Bella Union and a second album, A Hermitage. At the time, Lee cited the influence of bands like Metallica, Mogwai and Sigur Rös, but such was the trio’s energy levels, they seemed to draw more on thunderstorms, tidal waves, volcanic eruptions, blizzards and desert winds – a force of nature more than a band. It’s hard to believe but ONDA is even more dynamic and rhythmic, with the permanent addition of Jaehyuk Choi (drums) and B.K Yu (bass), fixtures of Jambinai’s live band since 2017. The way the quintet “sticks together like gears of a clock or machine,” says Lee, is celebrated on ‘Square Wave’, a breathtaking example of Jambinai’s ability to alternate between ambient serenity and molten ferocity. 13 minutes long, ‘In The Woods’ is the album’s lengthiest epic, originally recorded for Jambiani’s 2010 EP and now rearranged for the expanded quintet, plus guest traditional singer Bora Kim. The inspiration here is environmental pollution, soundtracked by eight minutes of mournful ambience that slowly builds to a shattering climax. “The earth is in serious pain,” Lee concludes. ONDA ends on a thematic note of drama and redemption. In ‘Small Consolation’, says Lee, “a person leads their weary body to a distant glow, which is small consolation. But when they get there, it turns into a big light, big consolation and happiness.” The closing title track comes in two parts: a calm prelude (featuring Lee on saenghwang, a tall reed mouth organ) before the euphoric main course, graced by choral grandeur. Once the music dies away, the feeling is one of blissful exhaustion. Says Lee: “After Jambinai’s US tour of 2017, I travelled the country for a month. I was worried about my future and the music because I had quit my job for the band but we didn’t have much money and the tour was tough and tiring for everyone. But when I visited the Grand Canyon, Mother Nature cheered me up and it was felt like she was telling me, “you are doing really well. Back in Korea, I wrote more songs with confidence and happiness.” The third wave of Jambinai is here…. Jambinai have announced a number of international festival appearances and headline shows, with more dates to be added soon. Today New York singer-songwriter Hannah Cohen is pleased to share another captivating new track from her forthcoming third album Welcome Home (due out April 26th on Bella Union) titled “All I Wanted”. Produced by Cohen’s partner Sam Owens, the producer/writer who performs as Sam Evian, the artist began developing the material that became Welcome Homein 2017. Taking her time with the songs, she wrapped herself in the fulfilling quiet of a new home, and a new creative partnership that supported finding a clarity in her writing and vocals. Many of the songs were written on an old, nylon-string guitar painted with Hawaiian scenes of beaches and palm trees (which can be heard on “This Is Your Life”), that, no matter the final arrangement, gives the songs a lighter touch, a warming glow that suffuses the whole album. Listeners may find echoes of folk and R&B, radiating with vocal-powered pop production, electronic accents, and bursts of pulsing guitar/bass/drums energy. Irresistible echoes of soul enchanters such as Carrie Cleveland (an early touchstone for Cohen and Evian), Marvin Gaye, Bill Withers and their friend and sometime collaborator Nick Hakim blend with the reflective shadings of singer/writer forebears such as Carole King and Harry Nilsson. That straightforward immediacy marked an important change in Cohen’s relationship with her music and the recording process. After growing up around professional musicians, she moved to New York from the Bay Area at 17, an intrepid adventurer who was drawn to New York’s singer-songwriter world. “New York became my world and my community, and formed me as a person, though I have never felt settled here until the last two years.” Her first two albums, Child Bride and Pleasure Boy, document the sound of a young artist finding her feet on a stage populated by established performers, a very public evolution toward the lived-in experience and command of Welcome Home.The desire to live on her own terms has recently led her to the less-crowded vistas of Woodstock, NY, a no-less iconic musical destination. Starting in May, Hannah Cohen will embark on an extensive North American tour supporting Foxwarren followed by some UK dates in August supporting Sam Evian.